Taste test: These chips packed an excellent crunch and delivered a nice crisp kettle chip experience. 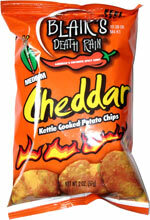 The taste was more spicy hot than cheesy. If you're looking for a good cheesy chip, you won't love these. 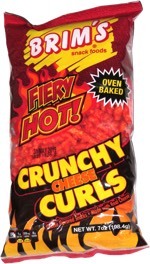 However, they're a great hot kettle chip. Blair's classifies the heat-level of this chip as "medium." Smell test: Oily, like a kettle chip. No discernable cheese aroma.